FREE DOWNLOAD – November 2013 DJPetey MixTape – Available Now! 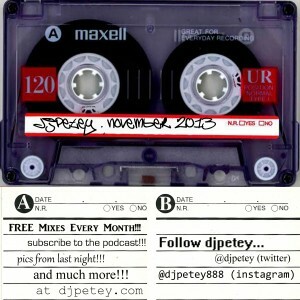 | DJPetey.com!!! FREE DOWNLOAD – November 2013 DJPetey MixTape – Available Now! The wait is over, people! As most of you know, the October Mix had to be cancelled because of a little national disaster called the boulder flood… BUT, We are back up and running and the November mix is HERE! (4 days late, I know… but its HERE!) Anyway, this month is ALL NEW MUSIC! 1 hour and 20 minutes of HEAT! Perfect for house parties, pregaming, working out, etc etc etc. But, enough talk. Click HERE to download or listen to the mix now (right click, save as to download – left click to listen now). Or, you can click “read more” below to check out the track listing. It feels good to be back! Welcome to November!